Start off your visit on the 2nd (Tue): discover the deep blue sea with a scuba or snorkeling tour. To find reviews, ratings, photos, and more tourist information, read our Port Douglas trip maker tool . Amritsar, India to Port Douglas is an approximately 20-hour combination of flight and shuttle. Due to the time zone difference, you'll lose 4 hours traveling from Amritsar to Port Douglas. When traveling from Amritsar in April, plan for slightly colder days and a bit warmer nights in Port Douglas: temperatures range from 34°C by day to 25°C at night. Finish up your sightseeing early on the 2nd (Tue) so you can go by car to Cairns. Plan my Cairns trip by asking Inpirock to come up with tips and suggestions. Traveling by car from Port Douglas to Cairns takes 1.5 hours. Alternatively, you can take a bus; or take a shuttle. April in Cairns sees daily highs of 34°C and lows of 26°C at night. Wrap up your sightseeing on the 3rd (Wed) early enough to travel to Townsville. On the 4th (Thu), go for a walk through Castle Hill and then see some colorful creatures with a scuba or snorkeling tour. To find reviews, traveler tips, ratings, and tourist information, read Townsville road trip planner . Traveling by flight from Cairns to Townsville takes 3.5 hours. Alternatively, you can drive; or take a bus. Expect a daytime high around 35°C in April, and nighttime lows around 24°C. Wrap up your sightseeing on the 4th (Thu) to allow time to travel to Brisbane. Kick off your visit on the 5th (Fri): admire the natural beauty at Roma Street Parkland and then stroll around South Bank Parklands. On your second day here, look for all kinds of wild species at Lone Pine Koala Sanctuary, then take some stellar pictures from Mount Coot-tha Lookout, and then find something for the whole family at Wheel of Brisbane. 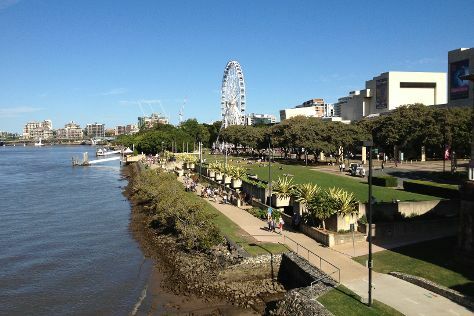 For traveler tips, photos, and other tourist information, you can read our Brisbane trip planner. You can fly from Townsville to Brisbane in 4.5 hours. Other options are to take a train; or drive. In April, Brisbane is a bit cooler than Townsville - with highs of 30°C and lows of 19°C. Finish up your sightseeing early on the 6th (Sat) so you can travel back home.